Allright. Let me just start off saying that I LOVE pumpkin. I’m one of those people who spends hours on StumbleUpon liking anything to do with pumpkin and baking (scones, pancakes, cookies, bread, candy…you name it). If I went back to see all my “likes” I could promise you half of them have something to do with pumpkin. I also must say that if I had the time, I would do the Pumpkin Challenge (where you make something with pumpkin in it every day of October). Unfortunately, being in school kind of leaves me with barely enough time to keep up with this blog. Anywaysss…My birthday is October 1st, and since before I can remember I have always had pumpkin pie as my birthday cake. 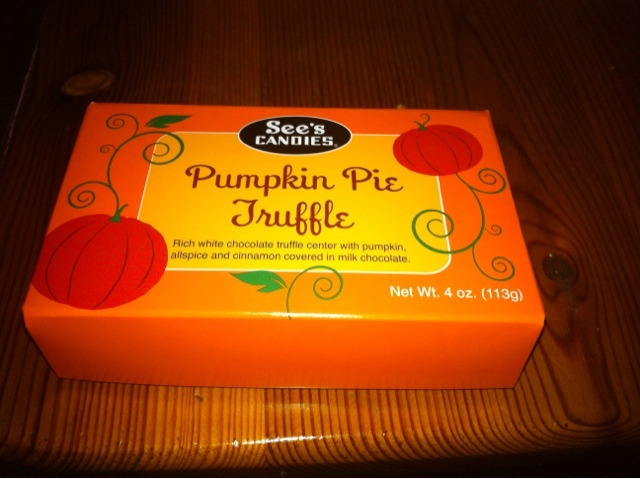 I always have pumpkin pie, and watch Willy Wonka and the Chocolate Factory (because it is my favorite movie, and they go to the factory on October 1st…hehe), and usually end up having some kind of chocolate treat while watching the movie. 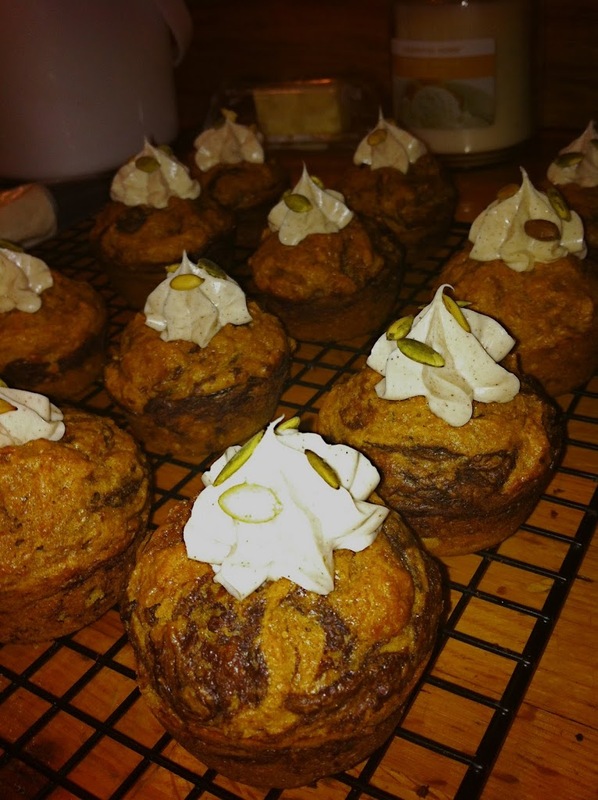 So when I found out that for the October Chocolate Blog Party, pumpkin was the seasonal ingredient to be paired with chocolate, I was uber excited! I immediately thought of doing chocolate/pumpkin bread. I wanted to make muffins, so then I figured I could do a cinnamon cream cheese filling (because who doesn’t like pumpkin, chocolate, and cream cheese!?). 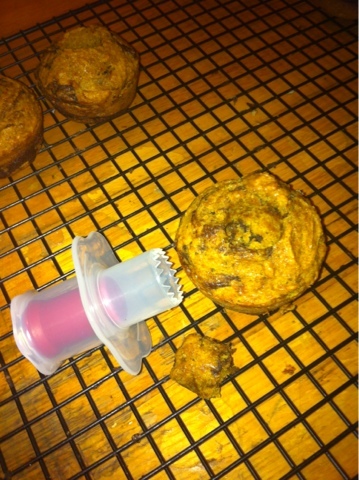 I have this cute little cupcake/muffin core-er tool, that works perfectly to stick fillings inside! 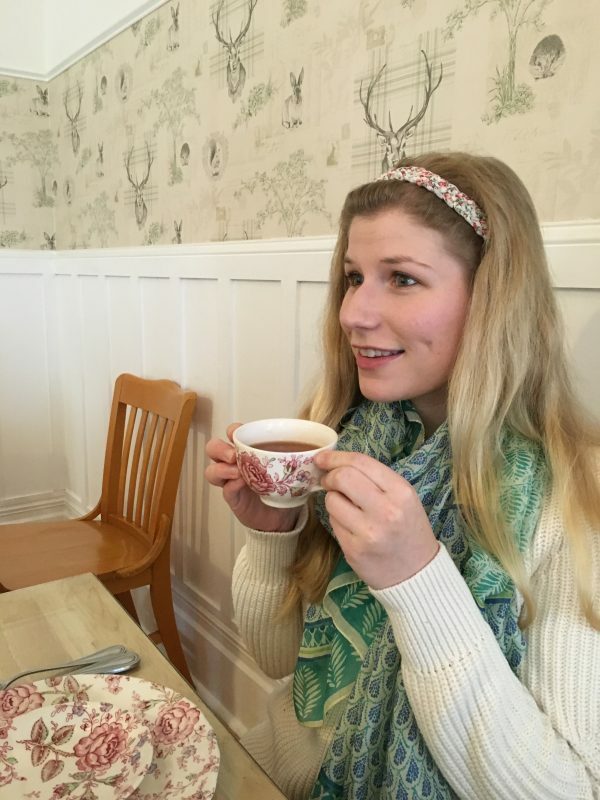 This is my first post with this blogging event! Can’t wait to come up with two more recipes with pumpkin and chocolate! 😀 Enjoy. Preheat the oven to 375 degrees. Grease your muffin pans. 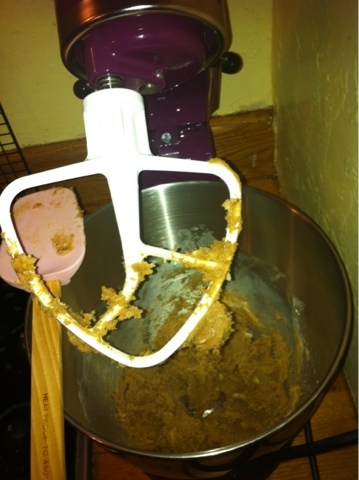 In the bowl of a stand mixer, cream the first 7 ingredients together until smooth. 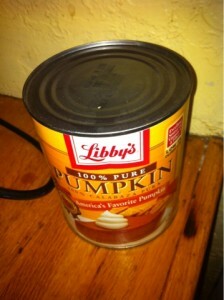 Add the pumpkin, granulated sugar, and eggs, mixing on low until everything is incorporated. Scrape the bowl to make sure nothing is stuck at the bottom, and mix again. Add the flour, and mix until it just comes together. Scoop the batter in to about ¾ of the way full. 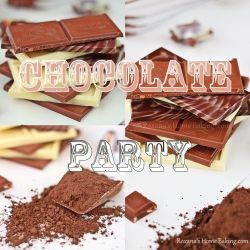 Melt your chocolate (either in the microwave, at 30 second intervals, or over a double-boiler). 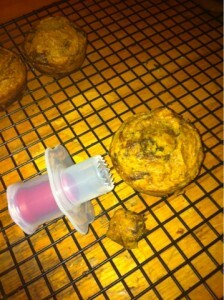 Using a spoon, scoop about 2 teaspoons of chocolate on top of each muffin. 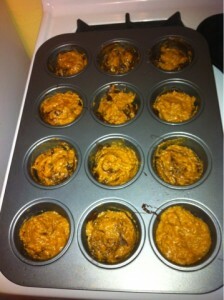 Then using a toothpick, swirl the chocolate into the pumpkin mixture. Bake for 20 to 25 minutes. While the muffins are in the oven, make your filling! In a small bowl, using a spatula or a whisk, combine all the ingredients and mix until smooth! If you want to just frost the tops of the muffins however you like (piping, or just smoothing it on with a knife even), go ahead. I did mine like this: Once the muffins had enough time to cool, using a muffin core-er (silly but very useful tool), take out a section of the middle. Then, transfer the filling to a piping bag, and pipe in to the opening, pulling the bag up so it leaves a star shape on top. 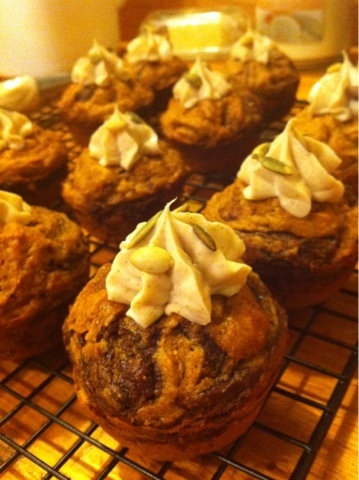 Then top with pumpkin seeds, mini chocolate chips, or whatever “garnish” you’d like/have! Ohh how I love Fall and October. Yummy pumpkin creations everywhere! 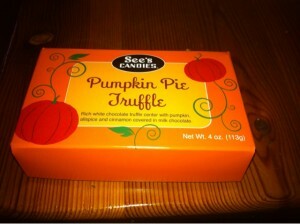 Like these Pumpkin Spice Truffles from See’s Candies my momma sent me in the mail in my birthday package. And these amazing pumpkin spice English muffins my roommates and I found at the grocery store! It never ends!! And that’s the way it should be at this time of the year! Great chocolatey posts by other blogging ladies!! 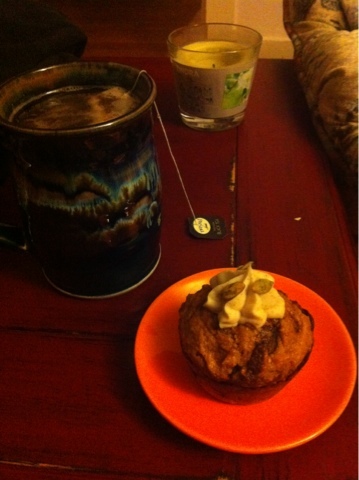 I love pumpkin, I love muffins, and I love chocolate!! Then you add cream cheese filling….yum! Thank you for reading Erin! 🙂 And yup, these four are definitely some of my favorite flavor combinations! Happy belated birthday! And I absolutely love pumpkin pie (so cute that that’s what you wanted for your birthday cake) – I used to load up on them for cheap after Thanksgiving and devour them myself. These muffins look wonderful and I love the cream cheese frosting – yum! Pumpkin pie has a huuuge following in my family, so we pretty much make it year-round with all the birthdays scattered! Haha I actually had a few friends say that they were cupcakes not muffins, because of the frosting…but they ARE muffins, just with filling! Hehe. What a nice treat to bring to the chocolate party. 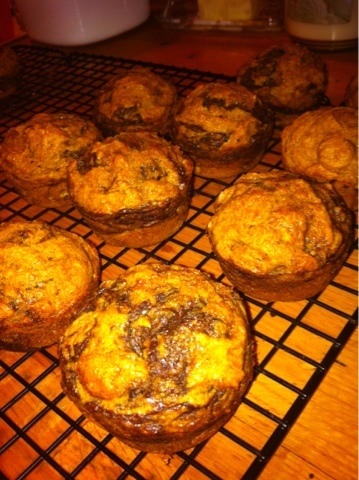 I love the marbling on the muffins and especially the cream cheese filling. Yum!